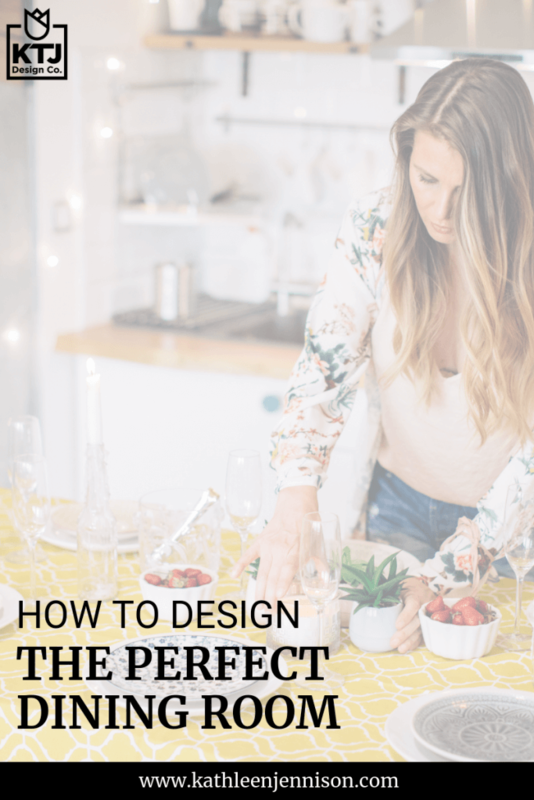 How to Design the Perfect Dining Room — KTJ Design Co.
You're having all the family over for the holidays, and that card table with the padded vinyl top and folding chairs is just not going to cut it. Sounds like you need a dining room makeover – and fast! The best place to start is with the one big piece – the table. In the design world, there are four types of dining room tables: traditional, modern, farmhouse, and trestle. You can’t go wrong with any of these styles. A traditional dining room table is refined. It feels prim and proper. Heck, the butler might pop in at any time (his name might be Carson?). Generally these will be made from mahogany or cherry with a graceful, curved cabriole leg. You'll notice this one has two leaves, which is nice because you can adjust the size to match your dinner party. A modern dining room table is elegant in all its mid-century classic design. Generally a lighter wood, it can be made of plastic or metal. A farmhouse dining room table feels oh so 18th century. This was the kitchen work table, after all. It will have turned or spindle legs and can be stained or painted. A trestle dining room table is certainly on trend right now. It can be made of rough sawn wood or have a more refined finish. The important thing to consider when picking a table is the shape and mood. If you have a designated dining room, then go with a more traditional dining room table. If you have a multipurpose room, consider something a little more casual, like a trestle table. As for the shape, round tables are great for conversation but require a larger space and won’t seat very many people. If you have a bigger family, a rectangular table with multiple leaves is your best bet. You can pick all sorts of seating for your dining room. You can have all the chairs match, or you can mix and match the chairs - just make sure something ties them together (such as the same color or the same fabric). To make it fancier, combine arm chairs and side chairs by putting arm chairs at the head and foot of the table and pile in as many side chairs as you can. I like a combination of upholstered and wooden chairs. If stains are going to freak you out, stick with wood chairs and add washable cushions or opt for high-performance fabrics. Settees or benches are a great alternative to side chairs. Settees look very luxurious and unexpected (not to mention comfy), and benches add another dimension to a rectangle table. Stay calm and collected this holiday season and let me know if you need help getting your dining room ready for your holiday guests. Book a consultation here.